Korean pop music, especially dance music, began to gain popularity among Chinese teenagers after it was introduced in earnest in 1997 by a radio program called Seoul Music Room broadcast from Beijing. The decisive moment in igniting Korean pop culture fever in China was the concert of Korean boy band H.O.T., held at the Beijing Workers’ Gymnasium in February 2000. 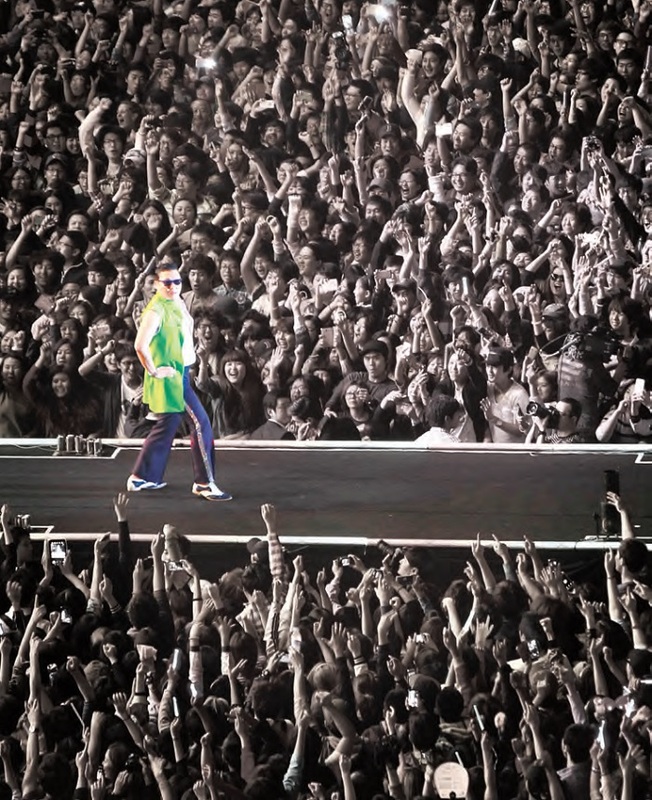 Korean news reports used the term Hallyu, or the Korean Wave, in describing this concert. The Korean Wave, acknowledged in an article published by Beijing Youth Daily as early as November 1999, began to finally be recognized by Koreans themselves from this point. “Gangnam Style” by Psy. The Psy’s “Gangnam Style” took the world by storm with the horse riding dance. It became the first K-Pop title to break into and top the UK Official Singles Chart Top 40 in 2012. The song also spent seven weeks at the #2 spot on the Billboard Hot 100 chart. The photo shows Psy performing for his Korean fans gathered at the Seoul City Hall Plaza the same year. The ‘Korean Wave’ craze has expanded to Korean traditional culture, food, literature and language, creating more and more enthusiasts. According to the latest figures, there were 987 hallyu-related organizations as of July 2013 with a combined membership of 9 million people. A great majority of these organizations are K-Pop fan clubs, but lately new groups of people whose interests are more diverse have begun to emerge. The rise of K-Pop on the global stage is probably best represented by Psy’s Gangnam Style, which swept the world as soon as it was released in late 2012. The song was the first K-Pop title reach No. 1 on the British Official Singles Chart, took 2nd place on Billboard’s Hot 100 in the US, and also topped the charts in more than 30 countries, including France, Germany, Italy, Spain, Russia, Canada, and Australia. The YouTube video of the song has been watched by more people than any other, with over 2 billion so far. The worldwide success of “Gangnam Style” was preceded by a surge of K-Pop idol groups, such as TVXQ, Super Junior, Big Bang, 2NE1, Beast, Girls’ Generation, 2PM and Wonder Girls, who dominated pop music markets across Asia. TVXQ had a total of 65 tour concerts in Japan from 2006 to 2012, bringing together about 700,000 fans and selling over 6.3 million albums, while in late 2009 Wonder Girls became the first Korean group to enter the US Billboard Hot 100 chart with the song “Nobody”. The popularity of K-Pop singers is largely based on their excellent vocal abilities, dazzling stage presence and wellchoreographed, impeccable dance performances among other things. While they may look comfortable and charismatic on stage, their performance is the result of many years of hard work rather than any inborn talent. More recently, K-Pop idol groups have tended to be more interested in joint performances with other performers contracted with the same agency. 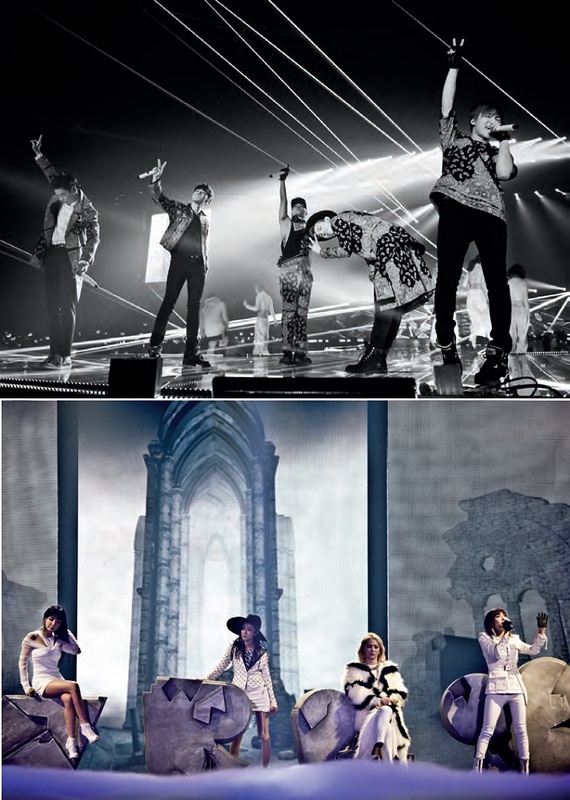 One of the most successful events of this kind took place in June 2011 when the artists of SM Entertainment staged a joint concert at Le Zenith de Paris in the French capital, attracting over 7,000 fans. The event is regarded as an important momentum for K-Pop artists to be received more seriously by the European music market. 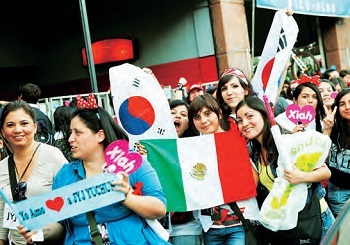 The year 2011 saw similar events held in several different cities around the world, starting with a K-Pop Festival that attracted over 45,000 fans to the Tokyo Dome in July. JYJ had concerts in Spain and Germany, and the artists of CUBE Entertainment performed in Britain and Brazil. In October, Girls’ Generation held a special concert at Madison Square Garden in New York whose success was covered on the front page of New York Daily News with a large photo of a concert scene and the rather sensational headline, “Attack of the K-Pop Stars.” In February the following year, another major K-Pop festival was held at the Palais Omnisports Bercy Stadium in Paris with over 10,000 fans coming from across Europe to fill the entire stadium. The great overseas success of What Is Love? (MBC) and Winter Sonata (KBS) in China and Japan played an important role in boosting the craze for Korean TV dramas across Asia and beyond. These hits were followed by Dae Jang Geum (MBC), an epic TV series about an orphaned kitchen cook who went on to become the King’s first female physician. Originally aired between 2003 and 2004, the drama became one of the highest-rated TV dramas in Korea before being exported to 87 countries around the world —including the Islamic states like Iran where it received as much as 80% of the viewers—to fascinate viewers with its portrayal of traditional Korean culture such as Korean Royal Court cuisine and traditional costumes and medicinal knowledge. The remarkable success story of Korean TV dramas continued in the 2010s with Big Thing (SBS, 2010), Giant (SBS, 2010), Secret Garden (SBS, 2011), Love Rain (KBS, 2012) and That Winter, The Wind Blows (SBS, 2013). Of these, Love Rain was exported to Japan for KRW 9 billion and That Winter, the Wind Blows to some local broadcasters in North America as well as ten Asian countries including China and Japan. Kim Ki-duk, Film Director Flanked by Lee Jung-jin and Jo Min-su (right) who acted in his film, Kim became the first Korean film director to win the Golden Lion at the 69th Venice International Film Festival with Pietà. The worldwide popularity of Korean pop culture resulted in the reemergence of hallyu (Korean Wave) movie stars such as Bae Yong-joon (better known as Yon Sama in Japan), Jang Donggun, Lee Seo-jin, Kwon Sang-woo, Won Bin, Jang Keun-suk, Lee Byung-hun, Rain, Jun Ji-hyun and Bae Doona. Of these, the last four have appeared as main characters in Hollywood movies. The outstanding international reputation that certain K-movie directors and stars enjoy today is in part due to the international film festivals held in Korea including the Busan International Film Festival (BIFF), the Jeonju International Film Festival (JIFF) and the Puchon International Fantastic Film Festival (PiFan). International film communities have recently begun to show a keen interest in Korean films and film directors. The Korean directors who have attracted the attention of Western critics include Im Kwon-taek, Lee Chang-dong, Park Chan-wook, Hong Sang-soo, Kim Ki-duk, Kim Jee-woon, Im Sang-soo and Bong Joon-ho, all of whom have produced masterpieces as if to reward their support and the expectations surrounding them, such as Strokes of Fire (2002) by Im Kwon-taek, Secret Sunshine by Lee Chang-dong (2007), Thirst (2009) by Park Chan-wook and The Taste of Money (2012) by Im Sang-soo. For Kim Ki-duk, a memorable moment came in September 2012 when he became the first Korean director to win the Golden Lion at the 69th Venice International Film Festival with Pietà. He made his debut as a director in 1996, just three years after suspending his art studies for which he stayed in Paris from 1990 to 1993, and began to pour out such works as Birdcage Inn (1998), The Isle (2000), and 3-Iron (2004), causing controversy among film critics and audiences alike. Alongside him, Park Chan-wook, Kim Jee-woon and Bong Joon-ho who have all been successful both commercially and critically and have been invited to Hollywood to make films for the wider film going public. In 2012, The Thieves, a film by Choi Dong-hoon, was invited to compete at the Contemporary World Cinema Program of the 2013 Toronto International Film Festival. The increased interest in Korean films among Korean filmgoers has recently produced some mega box-office hits. The Thieves, for instance, attracted 12.98 million viewers in Korea alone, and was sold to eight Asian countries including Singapore, Malaysia, Brunei and Indonesia. Several other films also attracted more than ten million viewers including Masquerade (2012), Silmido (2003), Taegukgi (2004), The King and the Clown (2005), The Host (2006) and Haeundae (2009). Meanwhile, the Guanajuato International Film Festival designated Korea as the guest of honor in July 2011, and showed a total of 76 Korean films including Whispering Corridors and Bedeviled under programs focused on Korean Horror Films and two film directors, Bong Joon-ho and Kim Dong-won. Quickly becoming a top Asian film festival after its launch in 1996, the BIFF provides the Asian movie community with an opportunity to present, watch, discuss and trade new films, documentaries, commercials, and independent films, both digital and analogue, amid worldwide media coverage. Held every July in Bucheon, Gyeonggi-do since 1997, PiFan presents Korean movie lovers with horror films, thrillers, mystery and fantasy movies produced in Korea and other Asian countries. Launched in 2000 and held annually in Jeonju, the home of traditional Korean culture, the JIFF focuses upon films that are marked by their artistic creativity whilst challenging existing conventions. 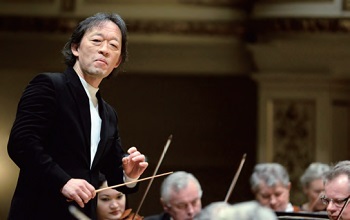 Maestro Chung Myungwhun served as music director and resident conductor of the Opéra de la Bastille in Paris. He received the Una Vita Nella Musica award from the Teatro La Fenice in Venice in July 2013. Korea has continued to produce distinguished vocalists of whom Sumi Jo (soprano), Hong Hei-kyung (soprano), Shin Youngok (soprano), Kwangchul Youn (bass) and Samuel Yun (bass baritone) are eagerly sought after by classical music lovers in many parts of the world. Regarding instrumental music, Yeol Eum Son (piano), Dong-hyek Lim (piano), Sarah Chang (violin) and Zia Hyunsu Shin (violin) regularly perform for their fans – mostly in Korea, the USA, and various European countries. Lee Hee-ah, a four-fingered pianist, is also a widely acclaimed pianist not only for her great performances but also for her heroic fight against a challenging physical condition. They were preceded by Korea’s first generation of classical musicians, including two pianists, Han Tong-il and Kun-woo Paik, who fascinated international audiences between the 1950s and the 1970s and who still play to many enthusiastic fans. Myungwhun Chung, the current maestro of the Seoul Philharmonic Orchestra, started his career in the world of classical music as a pianist, regularly playing as a member of the Chung Trio with his two sisters, Chung Kyung-wha, who won worldwide recognition as a violinist, and Chung Myung-wha, who plays cello. Later he turned to conductorship and has conducted some of the world’s most prestigious orchestras including the Berlin Philharmonic, London Philharmonic, and Paris Orchestra, before going on to serve as music director and resident conductor of the Opéra de la Bastille in Paris. Korean theater goers have recently begun to pay more attention to musical comedies presented on theater stages. The increased demand for good-quality musicals has resulted in the performance of world-famous musicals such as Jekyll & Hyde, Chicago and Cats either by the original or Korean teams, and the production of new musicals written and directed by Korean talents. Some of these Korean productions have been invited to perform in Japan and Southeast Asia. Korea’s thriving musical theater scene has resulted in the creation of a group of stars such as Choi Jung-won, Nam Kyung-joo and Jo Seung-woo, whose reputation has grown with stage musicals, and Yoon Bok-hee, Insooni and Ock Joo-hyun who have become great musical actresses based on their success on the K-Pop stage. The launch of the National Dance Company of Korea in 1962 provided the momentum for a surge of interest in modern dance in Korea. The changed environment eventually led to the birth of a great dancer, Sin Cha Hong (or Hong Sin-ja, born in 1943), who is now credited as Korea’s first avant-garde dancer and premier performance artist. She learned dance from Alwin Nikolais in the United States and worked there until 1990, and then returned to Korea to involve herself in various activities related with modern dance. Korea in the 1980s saw the foundation of two ballet companies, Universal Ballet (1984) and Seoul Ballet (1986), which are still actively producing classical ballet performances in Korea and abroad. The increased popularity of ballet resulted in the arrival of distinguished ballet dancers including Kang Sue-jin, who became the first Asian to be a member of the Stuttgart Ballet in 1986, where she is now a principal dancer. Other successful ballet dancers include Seo Hee who joined the ABT Studio Company in 2004 and became a principal dancer at the ABT in 2012, and Kim Ki-min who became the first Asian ballerina to join and become First Soloist at the Mariinsky Ballet in 2012. 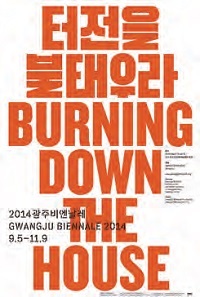 Gwangju Biennale Emerged as a major installation art show in Asia, the Gwangju Biennale has played a key role in linking the city of Gwangju with the rest of Korea and the world via contemporary art since the establishment in 1995 as the first of its kind in Asia. The first generation of Korean modern artists represented by Nam June Paik (1932-2006), who is considered to be the founder of video art, was followed by a new generation of distinguished artists such as Chang Ree-seok, Chang Doo-kun, Paek Young-su, Chun Kyung Ja, Tchang-Yeul Kim and Suh Se-ok. More recently, the Korean art world is represented by a group of painters and sculptors such as Chun Kwang Young, Park Seo-bo, Lee Jongsang, Song Soo-nam, Lee Doo-shik, Lee Wal-jong, Youn Myeungro, Lee Il, Kang Ik-joong, Lim Ok-sang, Kim Young-won and Choi Jong-tae, all of whom have gained international fans. Korea’s rapid economic growth in the 1970s resulted in the establishment of numerous public and private art institutions of which about 60 are located in downtown Seoul, Insa-dong and Samcheong-dong in particular, such as Gana Art Space, Seoul Art Center Gongpyeong Gallery and Kyung-in Museum of Fine Art. More recently, Cheongdam-dong in Gangnam-gu south of the Hangang River has emerged as a hub of Korean fine art. As for international art events, the Gwangju Biennale launched in 1995 has grown to be a major contemporary art exhibition in Asia. 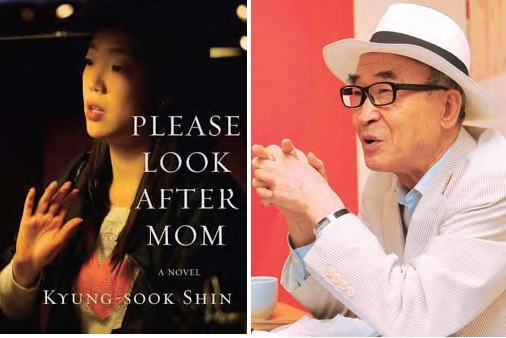 The publication in English of Please Look After Mom, a novel by Shin Kyung-sook, by Knopf Doubleday Publishing Group in the United States in April 2011 was regarded as a sign of the Korean Wave spreading to the international literary world. The book was listed in Amazon’s top ten bestsellers as soon as it was released on the American market, and was promptly published in about 30 countries in Asia (including Japan) and Europe, and in Australia. In June 2012, the author held a successful meeting in Ljubljana, the capital of Slovenia, to mark the publication of her work in the Slovenian language. Then, another work, Li Chin, was translated into French and published by the French publishing company Philippe Picquier. Gong Ji-young is another very successful Korean novelist of our time some of whose works, Our Happy Hours (2005), My Joyful Home (2007) and The Crucible (2009) were made into massive box-office hits and translated into Japanese. Korean contemporary poetry is represented by one big name, Ko Un, who has routinely been mentioned as one of the front runners for the Nobel Prize in Literature for quite a long time. He has continued to write poems that touch his readers’ hearts since his debut with Tuberculosis in 1958. He completed a massive series of poems, Ten Thousand Lives, in 2010, and had anthologies of his poems published in Germany and Turkey the following year. The English edition of Please Look After Mom by Shin Kyung-sook (left), and Ko Un (right), one of the most widely admired poets in today’s Korea. For contemporary Korean novels, the last two decades have offered novelists precious opportunities to find new readers overseas. Korean novels translated into foreign languages during the period include Secrets and Lies (Russian, 2009) by Eun Heekyung, The Rainy Spell, Firewood, and Sailing Without a Mast (Swedish, 2009) by Yun Heunggil, and A Distant and Beautiful Place (Chinese and Turkish, 2010) and Contradictions (Bulgarian, 2010) by Yang Gui-ja. The opening of the Korean Studies Department in Sofia University, Bulgaria, in 1995 led to the interpretation of a selection of Korean contemporary novels and short stories for local readers including A Dwarf Launches a Little Ball by Cho Sehui and Our Twisted Hero by Yi Mun Yol. The global craze for K-Pop has resulted in greater attention being paid to Korean literary works and the Korean language, particularly among young people. The King Sejong Institute, an institution established in 2008 to support Korean language education conducted across the globe increased the number of its affiliated schools from 17 in 2008 to 113 in 2013. Meanwhile, the 78th International PEN Congress took place in Gyeongju, the capital of the ancient Silla Kingdom for one thousand years, in September 2012. The gathering, held in Korea for the third time after 1970 and 1988, attracted 700 men and women of letters from 114 countries across the world, including Nobel laureates such as Jean-Marie Gustave Le Clézio of France, Akinwande Oluwole Wole Soyinka of Nigeria, and Ferit Orhan Pamuk of Turkey. Chefs in some restaurants in the United States began to combine traditional Korean dishes with Western traditions, creating the Bibimbap Burger, Kimchi Hotdog and Gochujang Steak for New Yorkers who are always ready to accept whatever’s new and exotic. Similarly, the number of Korean restaurants increased to about 100 in Paris alone, with many customers now being local French citizens, although in the past only Korean expatriates and their Asian friends formed the majority of customers. According to the latest research, the most popular dishes served by the Korean restaurants in Paris are bibimbap and bulgogi of which the former is particularly highly regarded for it nutritional balance as well as its flavor and taste. In July 2012, a special Korean style dinner was held at the Victoria and Albert Museum in London to celebrate the London Olympic Games. The 300 or so guests were greatly impressed by the Korean dishes served at the dinner.